Season the planks with salt, pepper, sugar, togarashi and drizzle with olive oil and place in cryovac bag with 1 pad of butter. Cryovac and cook in water bath at 87 degrees for 40 minutes. Take out of bath and allow to cool at room temp for 20 minutes and place into ice water to finish the cooling process. In a large saucepan, combine all ingredients except for tapioca starch, and cook until very soft and remove from liquid and cool. In blender, puree Kabocha until smooth. In a mixing bowl add puree with 1 lb of tapioca starch and make a slightly heavy dough. Roll out dough. Roll out sheets in a hotel pan for 8 minutes. Allow to cool completely. On a sheet pan with resting rack insert; carefully remove plastic film and place sheets onto rack and place into oven on the lowest possible setting for at least 3 hours or until completely dehydrated. After completely dehydrated and cooled, fry in a 375 degree fryer until puffs up to 3 times its size. 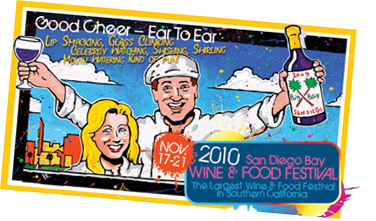 Experience the ultimate culinary showdown between San Diego’s finest chefs and action-packed week of wine and food events at the 7th Annual San Diego Bay Wine & Food Festival, November 17-21, 2010. 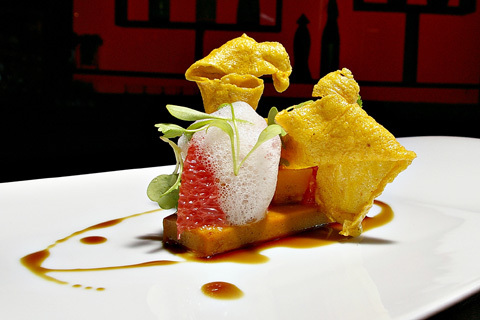 In a blender, blend the kabocha puree with the gelling agents until well incorporated. Bring to a boil in a sauce pan and immediately transfer to a 1/2 sheet pan and allow to set. This will happen very quickly, so be sure to work fast. In an ISI thermo-whip, place segments in and charge with Co2 and repeat twice. Charging a total of three times and refrigerate overnight. When ready to use, release gas with tip pointed up as not to lose any purge, remove form thermo-whip and cut into 1/4 inch pieces and garnish with this.